It doesn't take long to discover what fuels Scottish Fire, the new album by three-time fiddle champ Bonnie Rideout. Traditional reels, jigs and marches ignite Rideout's passion, often sending her bow racing across the strings in a manner that's bound to lift your spirit." "Her playing is so intensely personal and emotional that one feels like an eavesdropper." Stashed away in my memory over the years is an ever-increasing number of favored tunes that I have never had the opportunity to record. The music presented here ranges from J. Scott Skinner's Dr. Gordon Stables, a wonderful fiery reel I once played to garner my first national fiddling title as a young teenager, to "Fear A Bhata," a heartbreaking air, which after thrity years still bursts out of me during moments of intense melancholy.The final set of tunes, beginning with "Purser's Air," is a collection of new compositions written for old friends. An unaccompanied work, it reflects my undying passion for Scottish fiddle music. It is my wish that these melodies will grow on you as they have grown on me. 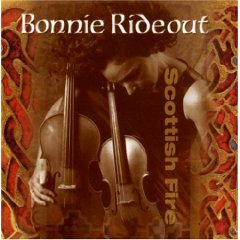 Bonnie Rideout's playing exemplifies the fiery spirit that is inherent in traditional Scottish fiddle music. Bonnie has long been a member of the National organization known as Scottish F.I.R.E. (F.I.R.E. is the acronym for FIddling REvival, Ltd.) This non-profit was established in 1975 for purpose of popularizing Scottish fiddle music in the U.S.